While being online is essential for all hospitality actors, sometimes I get asked if, “Is it truly useful to own an official website? 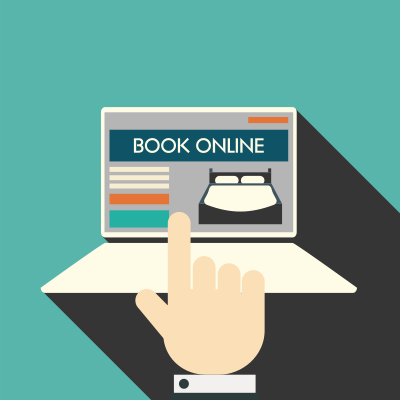 Can’t I simply subscribe to booking.com or airbnb and get on with it?” Having your own website is a major requirement for any hospitality entrepreneur who wants to take full advantage of the digital world. Who better than you to ensure your brand message gets through and reaches your customers directly? Don’t let others run your online business presence. Own your message, brand and bookings. Most importantly, don’t put all your eggs in one basket! Even before one single room is available for renting, a web agency is commissioned to carry out the following: create an official website available in 5 languages, open social media accounts on 7 different networks, ensure online presence on at least 3 tourism websites; the channel manager shall drive traffic from various sources, buy a landline, a fax machine, a new desktop PC, an iPhone and 2 iPads (you never know) etc. Be reasonable: even if you do manage to rent out your room at its full price all year round (which is pretty much impossible), your business will not become profitable. You’ve listed your accommodation facility on at least one or two booking websites. There you go! Let’s see if you can run your business by word of mouth. As soon as the profitability of your B&B facility relies exclusively on third-party websites, you really need to ask yourself what are the ultimate objectives of your digital presence. If you don’t have any, your business is certainly at risk. What Exactly Do I Need Then? Do not mistake your web presence for a mere act of “purchasing”! Way too many people think of setting up their website as something similar to unpacking their new PC. You’ve just bought it, and there’s nothing to worry about until it breaks down on you. Your online presence is similar to the book you’re about to write on your PC day after day, page after page. You should not stop right after the first chapter! Take things slowly, start by using a free website, build one yourself or have some friend build it because you can always change things along the way. Now, think of ways you can reach your customers: set up an online booking system, start by planning small loyalty programs for clients who book directly on your website, and you’ll see the difference! Time will advise you on changes you need to make. Is your guesthouse popular among bike riders and Belgian tourists? Translate your website into Flemish, buy some spare parts for a bicycle repairing service, and market yourself as a ‘bike-friendly’ accommodation on all websites targeting two-wheels traveling. Stand out from the crowd, and make a difference! Imagine your business is successfully listed on one booking platform for years, and suddenly, for reasons you ignore, your rating is in free fall and with it, your exposure and bookings. This could be completely unfair towards the top quality service you’ve been increasingly offering your customers and still: you have been rated negatively, you are not listed among searches, your partner quits business, and your online exposure is severely reduced. Having your own website is essential because this is the focal point of various channels (booking system, travel agency, tourism office, tourist guide, etc.) and must be fully managed by you. Your website must meet the business objectives you have thoughtfully set: entice your customers, send out a regular newsletter including updated content, and offer an interesting and punchy service. When it comes to digital management, you must take the bull by its horns! This article does not intend to advise you on choosing or leaving a particular web hosting provider: all you need to do is create a website, and then add an intuitive online booking system. Try enhancing the user experience while enabling an online access to your rental services. In return, you’ll get a solid base of loyal customers. I strongly recommend you use WordPress to create and host free websites which offers you optional premium plans for custom web design.